Voices From The War Zones At Home -- What Can We Learn From Occupied Peoples And Veterans? "We were safe at home when the bombs rained down on us for no reason. It was just me and my family in the house. There was a lot of shelling. We needed to get shelter under anything, anywhere. We went to our neighbor's house, and we found out that they had a basement. The basement was full, about a hundred people. The next day at 6:00 a.m., an F-16 strike hit us. Shrapnel fragments entered the basement through the windows, and the basement collapsed. There were 120 people in the basement; ninety percent were women and children. There were only about ten men. I didn't know where I was. Shrapnel went into my eye and my head. I couldn't see anything because of the smoke from the F-16 strike." "Shrapnel in the basement"--sudden destruction we cannot predict, in a place we were convinced was safe. A catastrophe wrapped in a shockingly unanticipated violation. There is first the horrific literal reality of the shrapnel embedded in the bodies of the wounded and dead. Then there are the metaphoric reverberations, the buried "emotional shrapnel" they, their families and their communities have to deal with for decades. A few years ago I met a group of social workers and other helping professionals from Gaza to share our experiences with trauma: the kind that comes with serving in the military in Iraq and Afghanistan (something I had experience with) and living and working in an occupied territory with frequent wars (something our guests had experience with). We spoke about how we understood and worked with the individual and collective impacts of war, and our personal experiences of working therapeutically military veterans, civilians, and their families. "I am so afraid in this building. They may hit it at any time. There is no safe place. Psychologically, that is the problem." His family had had "absolute faith" that Israel would warn them if their house was going to be bombed, but there was no warning. Thus the attack on their home and the sudden losses created a breach that was completely unexpected. Zeyada noted that his young daughters have now experienced three wars. "Can you imagine what that means to the new generation? Scared parents cannot assure or secure scared children." Today our own cities are rife with similar accounts of the terrifying impacts of the recent spate of officer-involved killings (not to mention years of continuous mass shootings). The resulting mental health impacts in our communities are trenchantly discussed by here Marc Lamont Hill and Mychal Denzel Smith. James Armstrong, Dallas pastor and community leader said today that a black teenager told him about entering a store and seeing a white policeman inside. The boy said he felt "awkward." The white policeman said to the black teen, "You okay?" The boy was silent. When the policeman said, "No, really, you okay," the boy began to cry. What a relief, "I get to live." It's a low bar for a positive interaction, but it is a start. A start to relearning that mutual trust is not a life-threatening miscalculation, that some of those tasked to protect and serve will do just that. Veterans from Iraq, Afghanistan and from all wars, know well two kinds of PTSD. One, which I call PTsxD, represents a cluster of debilitating anxiety symptoms with roots in a nervous system dysregulated by cumulative exposure to war-related trauma. Lower case "sx" refers to psycho-neurobiological symptoms that reflect shifts in arousal and reactivity such as increased irritability and anger, reckless behavior, hypervigilance, exaggerated startle response, concentration problems, and sleep disturbances. The "D" in PTsxD does not refer to a disorder, though lived and felt experience can certainly become disordered. It does not refer to a psychiatric disturbance, although experience can become quite disturbed and disturbing to others. Rather the "D" here relates to dysregulation, the body and brain's way of adapting to overwhelming traumatic experience in order to survive. In the second form of PTSD, which I call PTspD, the "sp" refers to impacts to a person's soul or spirit. This week people have often described the cumulative impacts of the many killings as soul-crushing. In this form of often unseen injury, sometimes called "moral injury," the "D" does not refer to a psychiatric disorder or disturbance. Rather it speaks to the dismantling of the natural connectedness among all registers. One is rent apart, the center cannot hold, the pain is too great; fragmentation and dissociation or even total collapse are the result. Not being able to get out of bed falls into this category. One element of moral injury is the blow that results when leaders or institutions tasked with helping and protecting betray their trust. While the experiences of service members in a war zone, civilians caught in repressive occupation by another country, and those suffering war-like conditions in our own cities have their differences, the overlaps are evident. Note the collapse of assumed safety and the resulting prevalence of dread. This breeds mutual suspicion, helpless rage and despair -- a toxic brew. Not to mention pure pain that feels unbearable. "I can't continue to live in a world like this -- it's too painful," said 19-year-old Taylor Quattlebaum during a Friday protest in Washington. "I can't continue to cry every night before I go to sleep. It hurts too much." Note that in one study, veterans reported that the driving force for their attempting suicide was emotional pain. Jennifer Jones, a 20-year-old student at Davidson College in North Carolina, standing outside the White House, said, "I don't want to become the oppressor. I don't want to become the enemy. I don't want to become the murderer." Then she added: "I want to be the person that can stand up and talk and fight for the right thing to happen." The best "treatment" for the post-traumatic shockwaves generated by recent homegrown terrorizing events is to put an end to the violence, to create conditions of peace, safety, and mutual respect. That means finding solutions to conflict that don't involve killing one another in military or civilian war zones. It means actually being protected rather than betrayed by those who would protect us. It means standing up, speaking out and being vigorously, relentlessly, peacefully pro-active. It also means activating tenacious, good faith efforts to reflect on what is going on and to understand the "other," whomever he or she is. This kind of systemic change will be slow in coming. Waking up is hard to do. Who knows, maybe joining the "watch list" of three countries who are warning their citizens about the dangers here for people of color, may shake us up a bit. The fight Jennifer Jones talks about is good and right to engage; it can also be adaptive for our mental health. But let's remember we're here, now. And we have learned what provides more immediate healing for these disabling impacts, what relieves the post-traumatic suffering of survivors and families of the dead and wounded, and the suffering we all feel to some degree. The answer is hidden in plain sight. 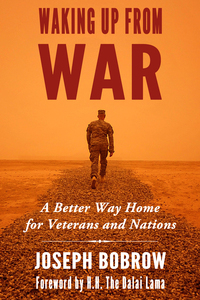 Read about that in Part 2, Transforming The Wounds Of War At Home, coming soon. 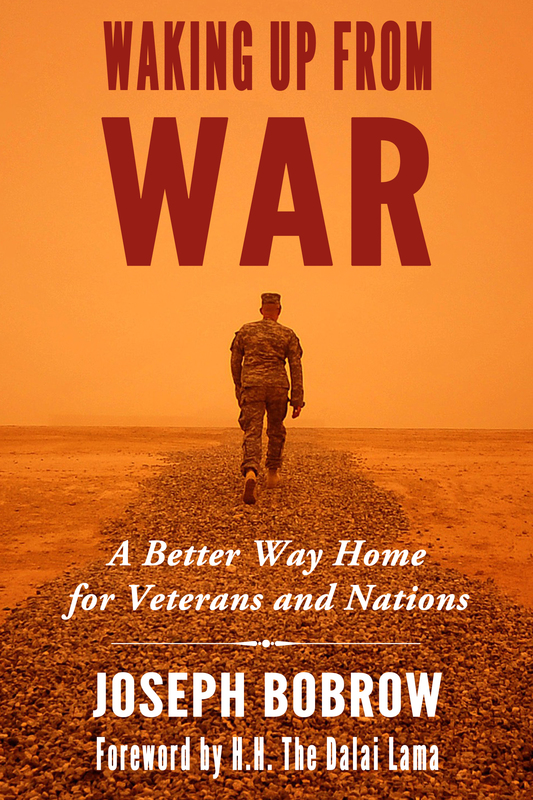 Check out Joseph's acclaimed new book, Waking Up From War, with a foreword by H.H. The Dalai Lama.